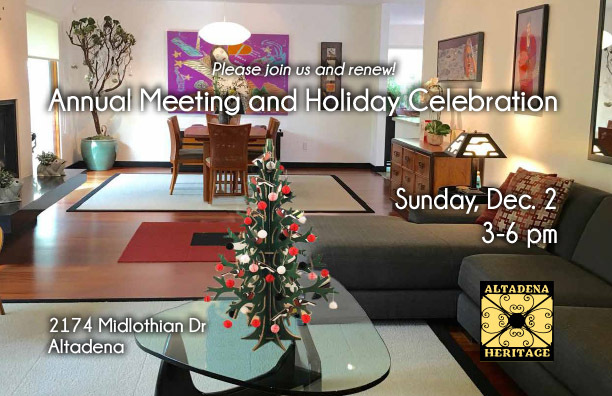 Our annual meeting and holiday celebration will be held at the exquisite home of Chantal and James Giddens. They chose their homesite for its magnificent mountain views — not for the house then standing on it. The Giddens transformed a California Ranch style residence into a modern Japanese-inspired courtyard habitat, complete with a studio for artist Chantal and a home theater. A short film about the preservation of Owen Brown’s gravesite will screen to get members up to speed on one of Altadena Heritage’s most significant recent projects. Mingle, eat, drink, and get involved at this members-only event: the time every year to join/renew commitment to Altadena’s most active civic organization.